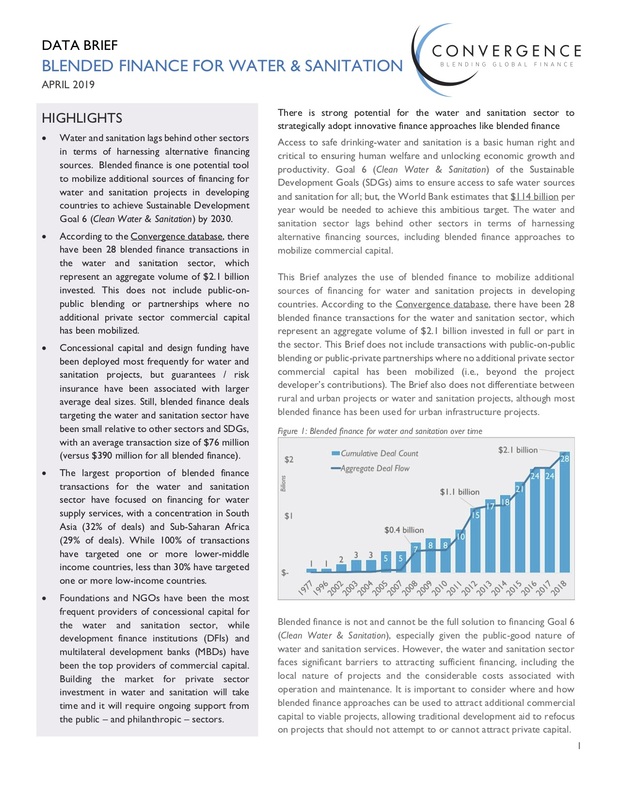 This Data Brief focuses on the use of blended finance to mobilize additional sources of financing for water and sanitation projects in developing countries. Convergence has collected data on 28 blended finance transactions for the water and sanitation sector, which represent an aggregate volume of $2.1 billion invested in full or part in the sector. The largest proportion of blended finance has focused on financing for water supply services (57% of deals), with a geographic concentration in South Asia (32% of deals). Blended finance deals targeting the water and sanitation have been small relative to other sectors and SDGs, with an average transaction size of $76 million (versus $390 million for all blended finance). Blended finance is one potential tool to mobilize additional sources of financing for water and sanitation projects in developing countries to achieve Sustainable Development Goal 6 (Clean Water & Sanitation) by 2030; yet, the sector lags behind others in terms of harnessing alternative financing sources like blended finance.